Hello again, dear readers and bug lovers! I was very pleased to discover this week that we recieved a photo all the way from Virginia Beach, Virginia. This one can be a real head-scratcher for those of you who have never seen one before, which is probably most of you! I first happened upon this insect in college while collecting insects in a huge parking lot at night. I saw some sort of large insect jumping and flying for several feet at a time. When I finally caught up to it, I was honestly taken aback by what I saw. It was a mole cricket; an insect that spends nearly its entire life underground, only coming to the surface to forage at night. So, Rachel Drew from Virginia Beach – that is what you found on your livingroom floor! Now, let me tell you a little bit about these odd – looking creatures. 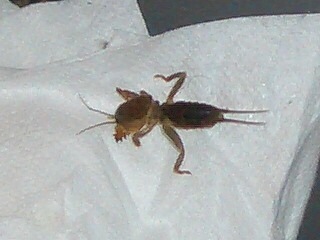 Mole crickets make up the family of orthopterans (grasshoppers, katydids, and crickets) called Gryllotalpidae. These crickets are made for digging, and if you look at them closely, their head, thorax, and front legs really do make them look just like a mole! The rest of their body looks more like a normal cricket. Their front legs are equipped with little claws which help them dig and construct their tunnels. These claws are called dactyls and their number and arrangement help scientists differentiate between certain species. Most species have well developed wings which can carry them for about 5 miles during their mating season. They are also very good swimmers. Mole crickets are omnivores, and they will will feast on worms, insect larvae, and roots underground as well as grasses at the surface. I’m not sure which species is pictured here, but more than likely the Southern mole cricket or the tawny mole cricket. It looks as if it may be immature due to the lack of well developed wings. These two species are most common in the southern part of the country. Unfortunately, they are both introduced species and can be considered pests in some areas. These little guys are harmless, however, and for those who are lucky enough to spot one, a really great photo opportunity! Well, thank you so much for sending in the great photo Rachel, and for reading about us in Virginia! This insect will always hold a special place in my heart as one of the weirdest looking things I’ve seen! As always, Happy bug watching! Want to learn more about insects? Keep reading. Check out an insect that spends the summer singing. Costa Rica: bug geek paradise. What a photo of a molecricket in North Texas? On any given night during the last three weeks I could have photographed at least 100 of these little critters which have invaded my home. Had the pest people out last week to spray again to no avail. They started showing up about 3 years ago in July but each year the infestation gets worse. Nobody likes hearing a constant crunch as you walk across the floor. Unfortunately, certain environmental conditions can cause a species of orthopteran to swarm and show up in great numbers. I remember driving through towns in East Texas and stopping at a what-a-burger that was absolutely crawling with field crickts! It was like a scene from a bug horror film. I’m sorry to hear about your infestation and I hope you can get it under control. That is a very unfortunate sound to have to hear so often. Previous Post Mixers, Elixirs, & IMAX 2008 - tell us what you think! Next Post Michael Phelps and solar power - what's the connection?